For an eclipse to take place, three celestial bodies must find themselves in a straight line within their elliptic orbits. This is called a syzygy, from the Greek word "súzugos," meaning yoked or paired. From our viewpoint on Earth, there are two kinds of eclipses: solar and lunar. In a solar eclipse, the moon passes in between the sun and Earth, which results in blocking our view of the sun. 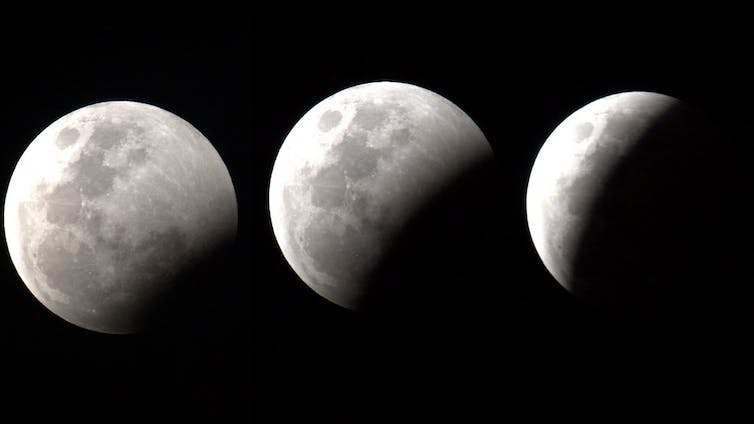 In a lunar eclipse, it is the moon that crosses through the shadow of the Earth. A solar eclipse can completely block our view of the sun, but it is usually a brief event and can be observed only in certain areas of the Earth's surface; what can be viewed as a total eclipse in one's hometown may just be a partial eclipse a few hundred miles away. The level of astronomical knowledge achieved in ancient Babylonia (southern Mesopotamia) cannot be separated from the astrological tradition that regarded eclipses as omens: Astronomy and astrology were then two sides of the same coin. According to Babylonian scholars, eclipses could foretell the death of the king. The conditions for an omen to be considered as such were not simple. For instance, according to a famous astronomical work known by its initial words, "Enūma Anu Enlil" - "When (the gods) Anu and Enlil" - if Jupiter was visible during the eclipse, the king was safe. Lunar eclipses seem to have been of particular concern for the well-being and survival of the king. In order to preempt the monarch's fate, a mechanism was devised: the "substitute king ritual," or "šar pūhi." There are over 30 mentions of this ritual in various letters from Assyria (northern Mesopotamia), dating to the first millennium B.C. Earlier references to a similar ritual have also been found in texts in Hittite, the Indo-European language for which we have the earliest written records, dating to second-millennium Anatolia - modern-day Turkey. In this ritual, a person would be chosen to replace the king. He would be dressed like the king and placed on the throne. To avoid confusion with a real coronation, all this would occur alongside the recitation of the negative omen triggered by the observation of the eclipse. The real king would keep a low profile and avoid being seen. If no additional negative portents were observed, the substitute king was put to death, therefore fulfilling the prophetic reading of the celestial omen while saving the life of the real king. This ritual would take place when an eclipse was observed or even predicted, something that became possible to do in later periods. The presence of this ritual among the corpus of Hittite texts in second-millennium Anatolia has led to the assumption that it must have existed already in Mesopotamia during the first half of the second millennium B.C. Although omens predicting the death of the king are already known for this earlier period, the truth is that the main basis for such an assumption is an interesting story preserved only in a much later, first-millennium composition known by modern scholars as the "Chronicle of Early Kings." According to this late chronicle, a king of the city of Isin (modern Išān Bahrīyāt, about 125 miles to the southeast of Baghdad), Erra-imitti, was replaced by a gardener called Enlil-bani as part of a substitute king ritual. Luckily for this gardener, the real king died while eating hot soup, so the gardener remained on the throne and became king for good. The fact is that these two kings, Erra-imitti and Enlil-bani, did exist and reigned successively in Isin during the 19th century B.C. The story, however, as told in the late "Chronicle of Early Kings," bears all the trademarks of a legend. The story was probably devised to explain a dynastic switch, in which the royal office passed from one family or lineage to another, instead of following the usual father-son line of succession. Mesopotamia was not unique in this regard. For instance, a chronicle of early China known as the "Bamboo Annals" (竹書紀年 Zhúshū Jìnián) refers to a total lunar eclipse that took place in 1059 B.C., during the reign of the last king of the Shang dynasty. This eclipse was regarded as a sign by a vassal king, Wen of the Zhou dynasty, to challenge his Shang overlord. In the later account contained in the "Bamboo Annals," an eclipse would have triggered the political and military events that marked the transition from the Shang to the Zhou dynasty in ancient China. As in the case of the Babylonian "Chronicle of Early Kings," the "Bamboo Annals" are a history of earlier periods compiled at a later time. The "Bamboo Annals" were allegedly found in a tomb about A.D. 280, but they purport to date to the reign of the King Xiang of Wei, who died in 296 B.C. Gonzalo Rubio is an associate Professor of Classics & Ancient Mediterranean Studies, History, and Asian Studies, Pennsylvania State University. This article first appeared in The Conversation.